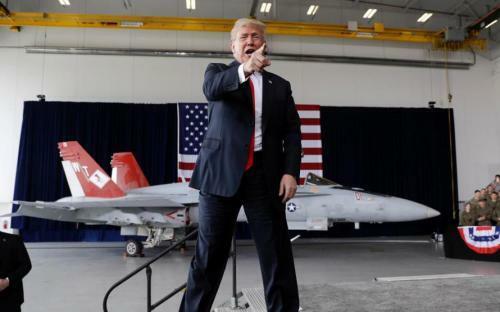 "Not On My Watch": Trump Warns Left Over Escalating Confrontations, Tells Voters "Time To Defend Our Principles"
President Trump has put the left on notice after several key members of his staff were publicly harassed over his administration's "zero tolerance" immigration policy, telling supporters in a letter: "Not on my watch." After several high profile harassment incidents, Democratic Rep. Maxine Waters (CA) tossed a can of gasoline on the dumpster fire last weekend, calling for people to form into mobs and physically confront members of the Trump administration if they see them out in public. Since then, White House advisor Stephen Miller's apartment was swarmed by protesters who tacked up "Wanted" posters, and on Tuesday a group of Georgetown students harassed Senator Mitch McConnell (R-KY) and his wife. And on Monday, we reported that a decapitated and burned animal carcass was found on the porch of a Department of Homeland Security (DHS) staffer, according to WTOP/ABC. Around two dozen incidents have been reported against government employees issued in the past few days - primarily against Immigration and Customs Enforcement (ICE) officers, which resulted in a determination by Homeland Security that there is a "heightened threat against DHS employees." Sarah Huckabee Sanders was kicked out of a restaurant. Kirstjen Nielsen was harassed in her own home. Homeland Security staffers have been warned of “increased threats” from the open borders mob. ...And now Democrat Maxine Waters is calling for MORE HARASSMENT of the Silent Majority. The Left is trying to bully and buy their way back into power. Not on my watch. I will always stand up for you. The President followed up on this thread this morning, tweeting about the "unhinged" left and once again highlighting Maxine Waters' "crazy rants." Trump then segued into political double standards, free speech, and the prospect of fighting back. Can we finally admit the truth? Democrats only care about “equal rights” if you’re a liberal. But if you believe a country MUST have borders, the Left doesn’t want you to have a voice in America. It’s time to defend our principles and the agenda America proudly voted for. All this, because the left has been whipped into a frenzy after pictures of Obama-era minors in cages went viral, and Time magazine printed a disingenuous cover depicting Trump towering over a crying migrant child who was never actually separated from her parents. Add the MSM frequently omitting the word "illegal" before "immigrants" to imply Trump is a racist, and we now have protesters accosting Trump administration officials in public and at home. Through our interviews and correspondence with detainees, we’ve been able to document the experiences of mental anguish caused by detention and physical abuse suffered by many immigrants. We’ve heard stories of how parents are separated indefinitely from their children; how lesbian, gay, bisexual, and transgender (LGBT) detainees are placed in segregation for months; how detainees struggle to get medical attention, make a phone call, or visit with a loved one. ICE continued to detain her, shuttling her from one cell to another in Phoenix, exposing her to terrible jail conditions and keeping her in a constant state of uncertainty and fear, separated from her family. Another woman interviewed was separated from her breastfeeding baby daughter, who was less than two months old, while she was detained in Eloy for two weeks. Trump, meanwhile, signed an Executive Order last week ensuring that migrant families would not be separated, while his administration pledged to reunite already-separated minors with their loved ones. Meanwhile, there were some amazing revelations during last week's Congressional testimony related to the Clinton email investigation, but never mind all that "largest scandal in the history of the Republic" nonsense - it's all about migration now.